Board Game Saturday on Wells 18 February 2012 | Action Points! Since Steven departed the main campaign last week, we have decided to try and put the “main” campaign on hold and start a new campaign in the same setting, during the same timeframe and events, but focused on a different faction and set of characters. Each player has come up with a warforged character, which will form a new party representing agents of the Iron Council, which purports to represent warforged interests in the campaign setting. The main party have had encounters with the Iron Council in the past, and they are important to TC’s plot line, so this will be a good time to explore their motivations and I am planning to tie in some of the Iron Council’s other machinations to the main party eventually. Also, I get the feeling that the players are itching to try out some other classes and characters than their regular main party. I’m hoping to have some sessions with the main party as well, but I’ll see how it goes. Anyways, on to the actual session itself. Most of the time was spent trying to work out some background details for the new characters and exploring possible plot hooks. 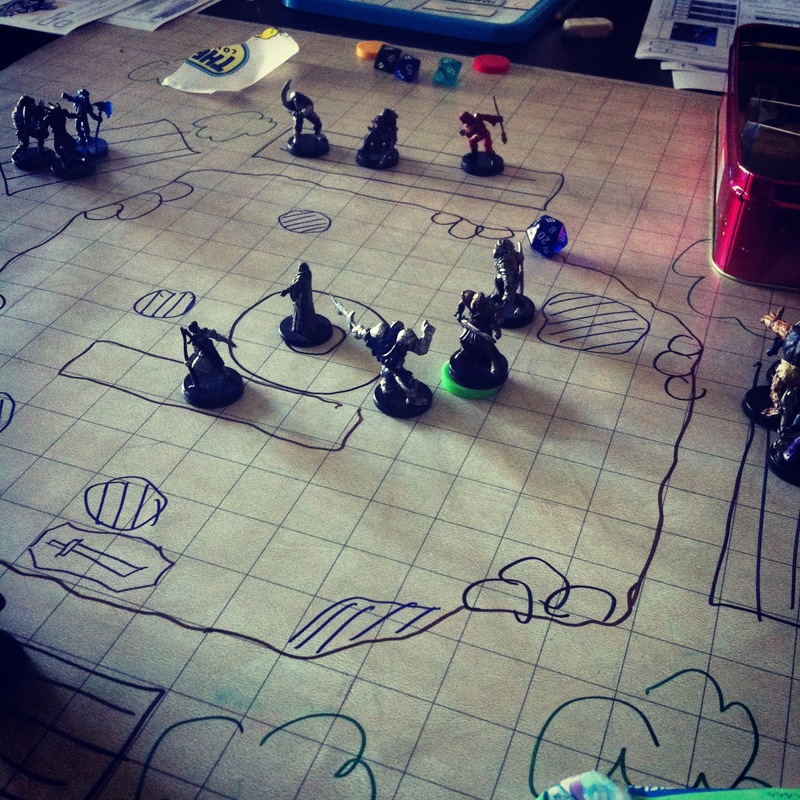 I also ran a couple of quick encounters to see how the characters worked together mechanically in combat. 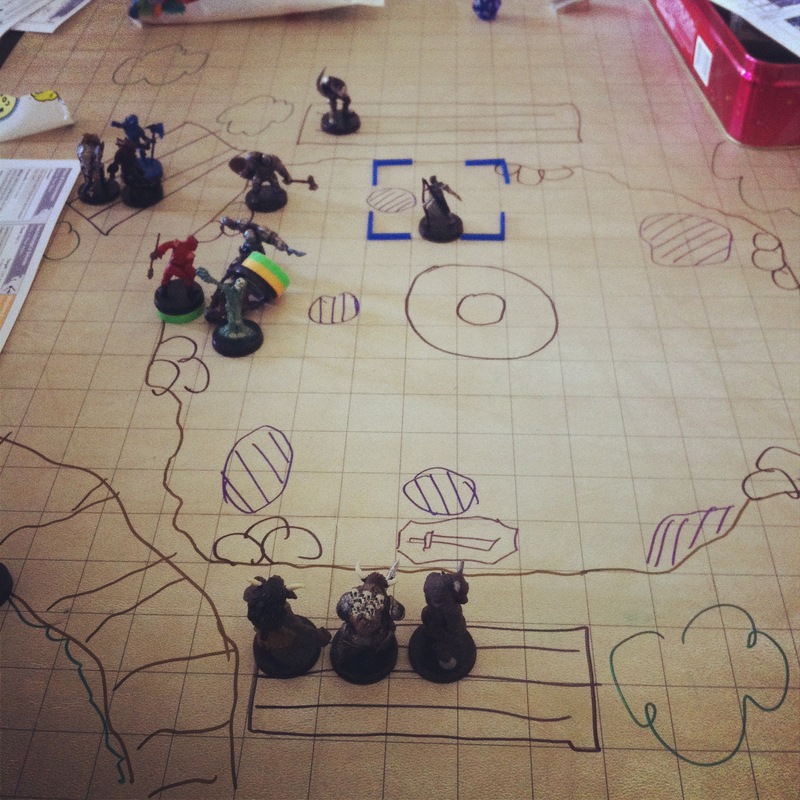 The premise was simple, pitting the party against some enemies in an arena, trying to claim the prize of a magical sword. Healing was a concern we wanted to investigate as no one created a leader, but there are ways to work around that. Jinwei finally got to roll heaps of damage dice as a striker and managed to score multiple critical hits for massive damage over the course of the two encounters. Gerald and Jon managed some good control just through their marks, and I can foresee many interesting combat situations in the future, with two defenders. In the end, the characters triumphed after some terrible rolls by the arena champion but they definitely felt the lack of a leader as their health resources were nearly exhausted after the two encounters. I think we still have some tweaks to be made to the characters, and I’m hoping to start the new campaign chapter proper either this week or next. 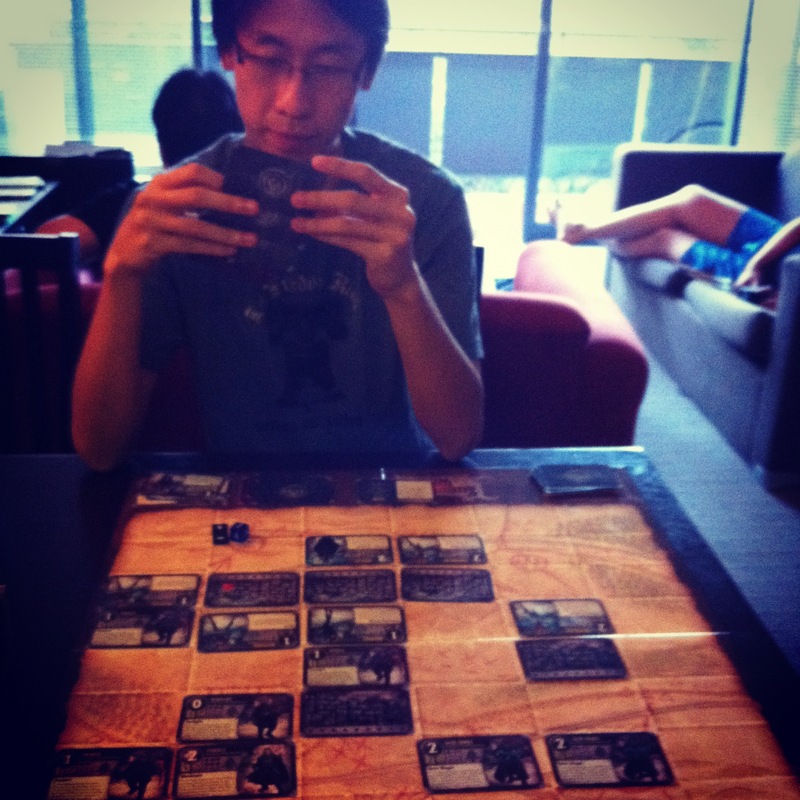 After a break for dinner, Jinwei and I sat down for a game of Summoner Wars while we waited for the board game players to arrive. 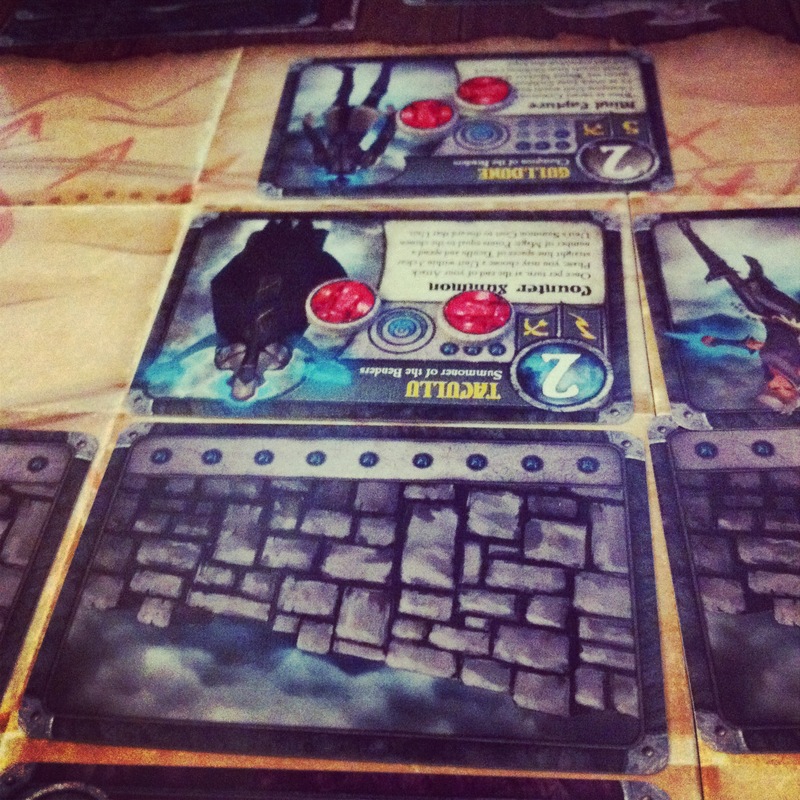 Summoner Wars is a two player tactical card game, that simulates a very simplified miniatures combat game using a battlegrid and cards. I only have the Summoner Wars Master Set, which comes with 6 factions and there are also many other faction decks available. Keep in mind, this is not a collectible/trading card game, as the contents of each faction deck available are set and known. 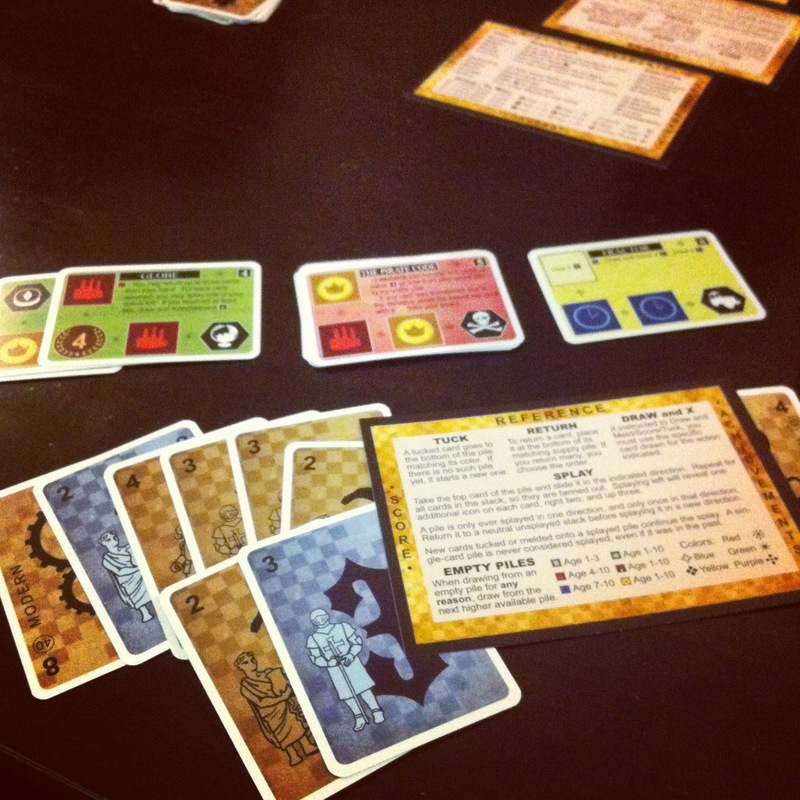 We deliberated long and hard on our faction choices, and then randomly pulled out a deck each from the box. 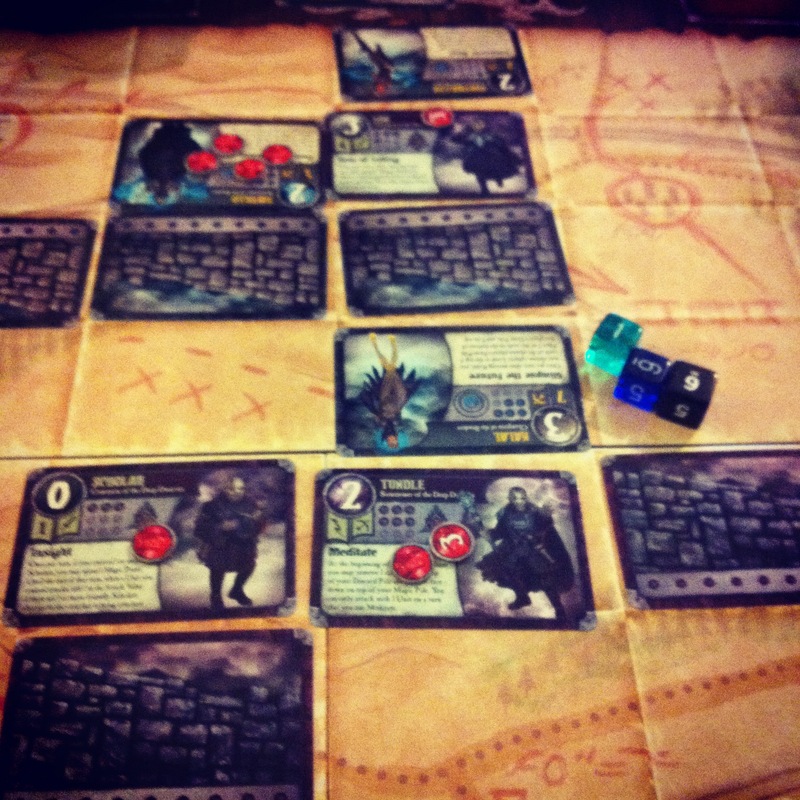 I took the Deep Dwarves out for a spin, while Jinwei took the side of the Benders. I started the game quickly with multiple Gem Mages and a Miner trying to push through the right flank. 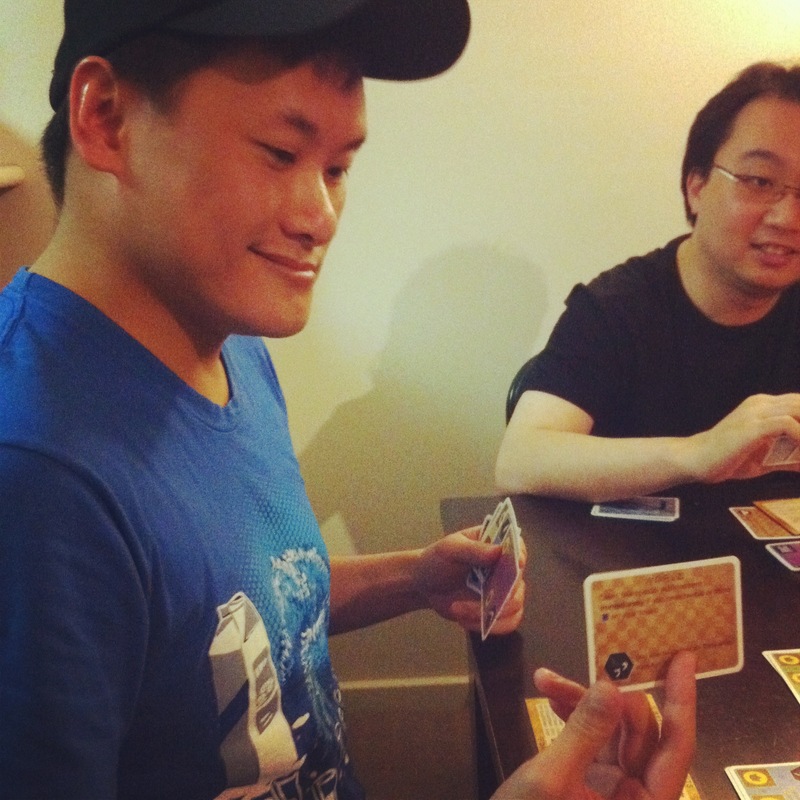 Jin Wei mustered a strong defense on his left, which further encouraged me to focus on the right. I made some good advances into his territory, especially after I summoned a Champion Unit, which let me score the first hit on his summoner with a Gem Mage. 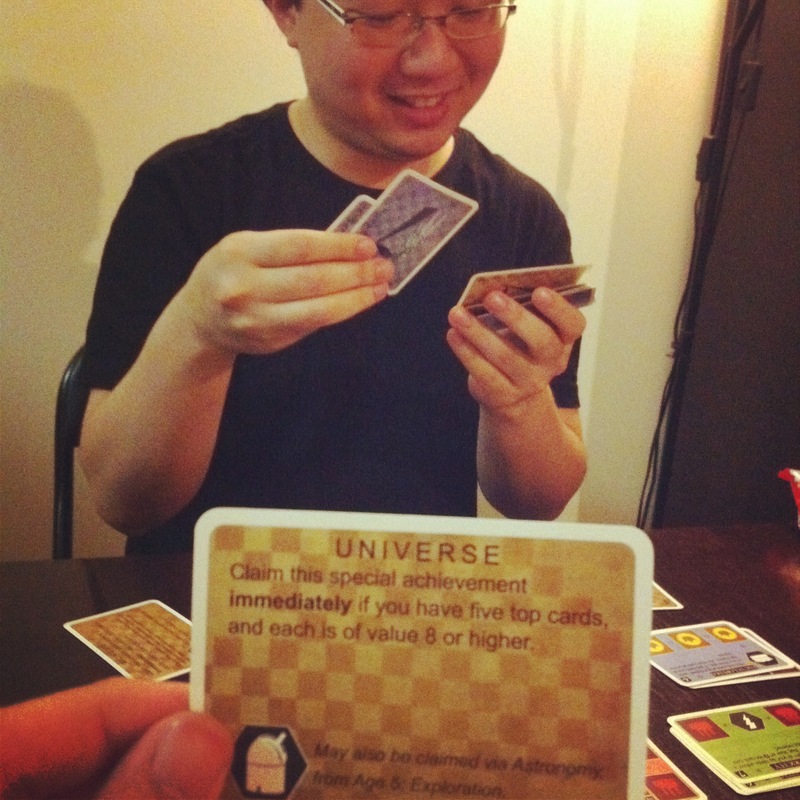 However, Jinwei had the multiple Mind Control and Event Card stealing effects to blunt my initial assault. I still managed to push through until it came down to my last attack against his. I rolled 1 less hit than I needed, and Jinwei capitalized on that to surround my Summoner and kill him off, taking the win! 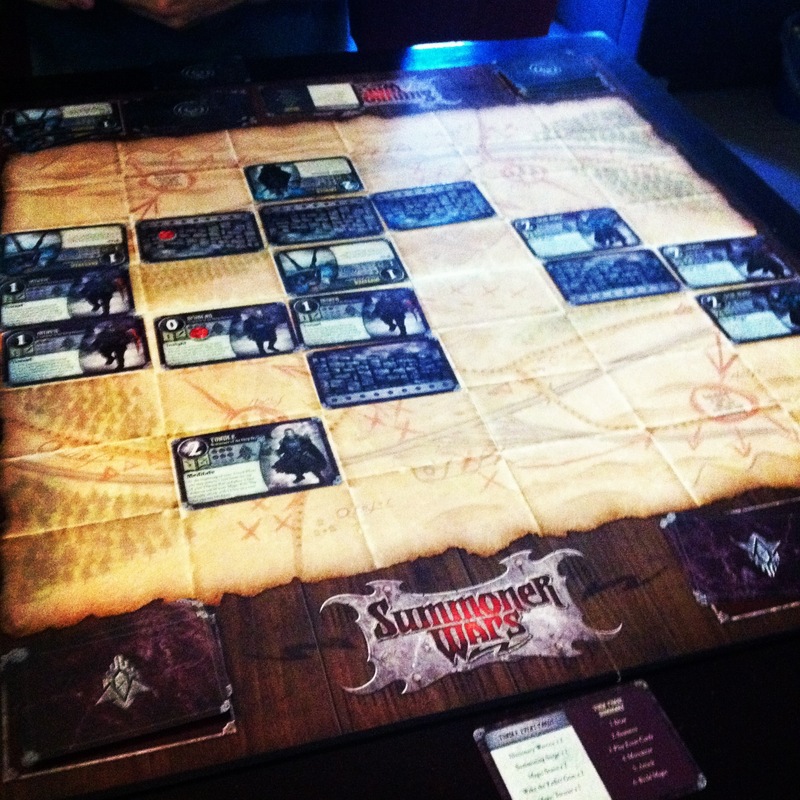 I really enjoyed my first game of Summoner Wars. The basic rules of the game are pretty simple: Draw to 5, then summon units next to your walls using cards from your magic pile, play events or wall, move 3 units up to 2 spaces each, attack with up to 3 units, and discard any number of cards to the magic pile. Voila, you’re good to go. The fun and complexity of the game comes from the various special abilities on the units and events. I probably committed too much too fast in the early game, and the Deep Dwarves seemed to want to use a whole lot of magic which led to me running out of cards before Jinwei and having less options in the late game. I’m curious to try the other factions in future games, and I am quite excited to play again. 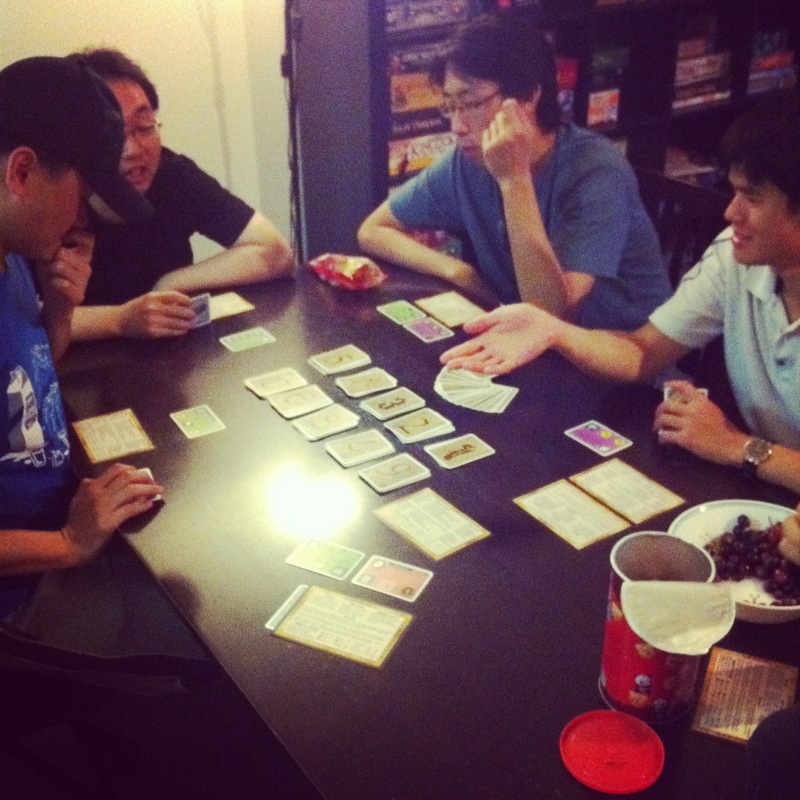 After Summoner Wars, we started a 5 player game of Innovation with the Echoes of the Past expansion. This was the longest game of Innovation I have played yet. It was also one where the Special Achievements played a huge part, with at least 4 Special Achievements being claimed in the mid game: Monument, Universe, Wonder and World. Steven managed an impressive start and quickly amassed 4 Achievements while most of us were only on 1 or 2. I didn’t even manage to get my first Achievement until fairly later, on the back of some strong Piracy actions. There was a lot of back and forth as Steven came close to winning multiple times, and we all took turns stealing his Score cards or returning them. 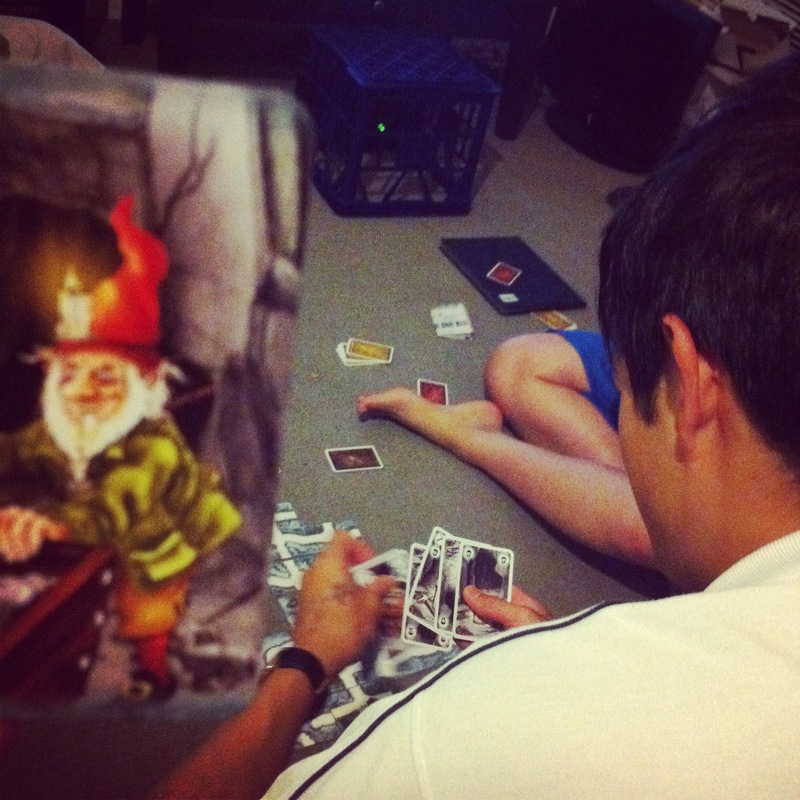 We also had an amusing and strange situation where Gerald managed to empty the pile of Age 10 cards before the rest of us could even draw one. 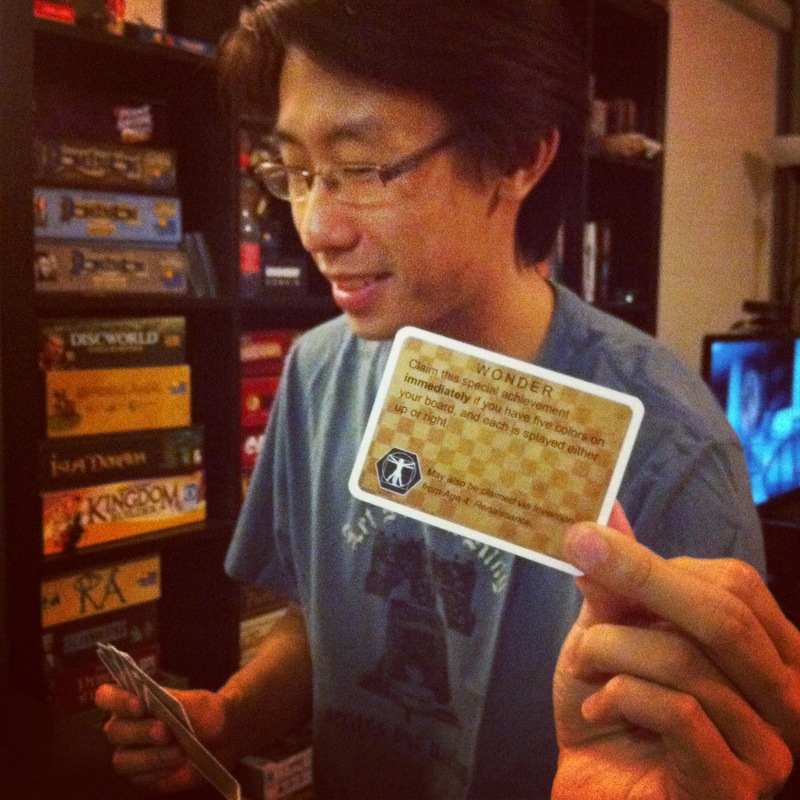 Steven finally managed to recover his Score cards and obtain his last Achievement, leading to his sweet victory! I think we were slightly weary toward the end of the game, as some of the combinations of cards were truly ridiculous and led to some long turns, and we all knew Steven would eventually win the game as we were fast running short on viable options to prevent his victory while also allowing our own victory. 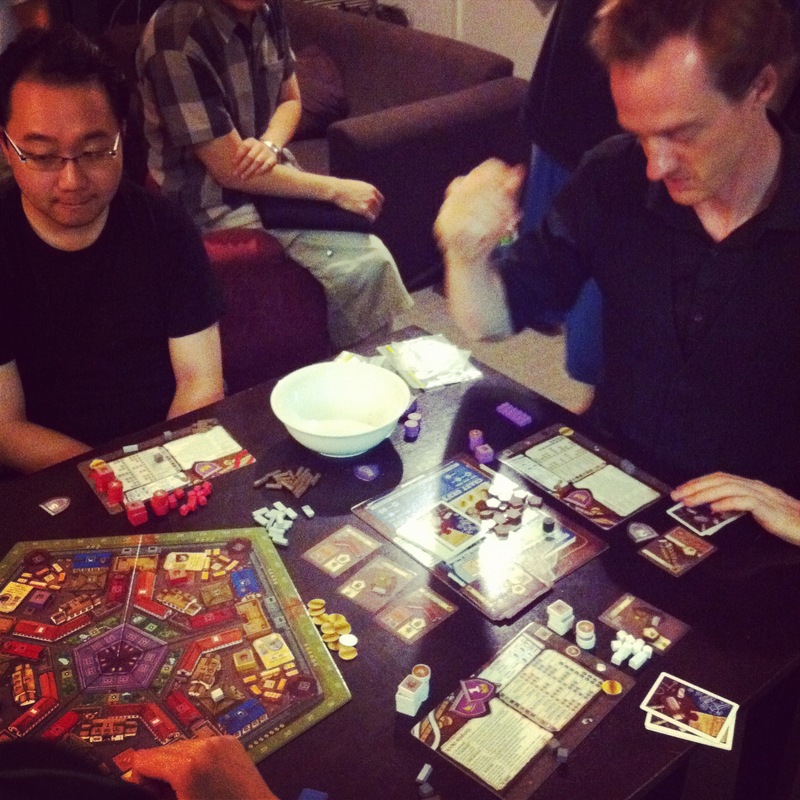 After Innovation, I started up a game of Belfort which I will talk about later, while another group played Saboteur. Saboteur is a pretty simple game of playing down tunnel path cards to connect a tunnel entrance card with one of 3 destination cards, which will hopefully contain gold to be shared amongst the team. 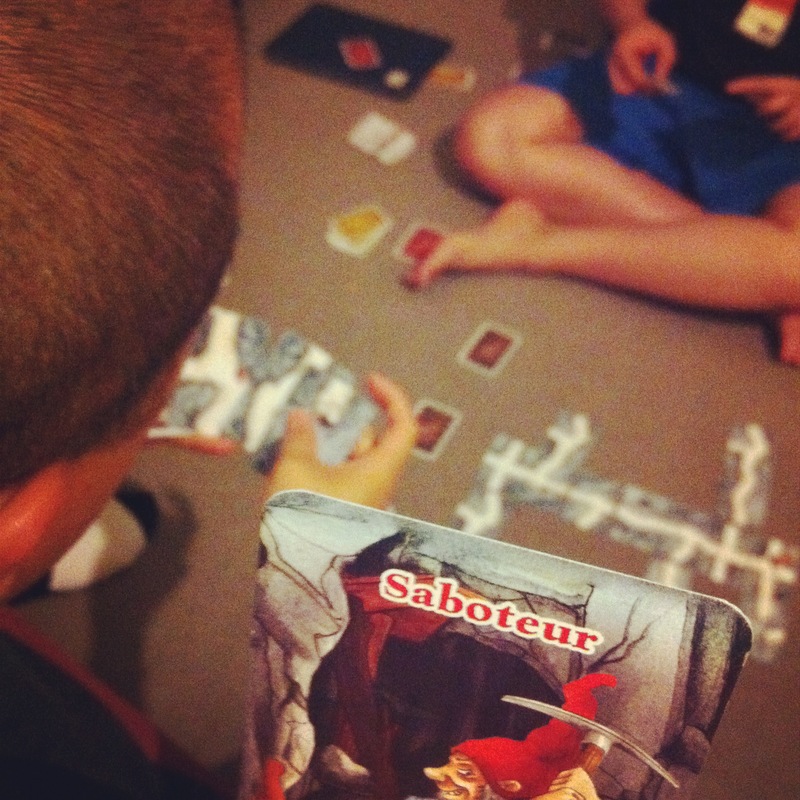 However, there is the possibility of a Saboteur in the game, whose purpose is and wins by preventing the other players from reaching the gold. 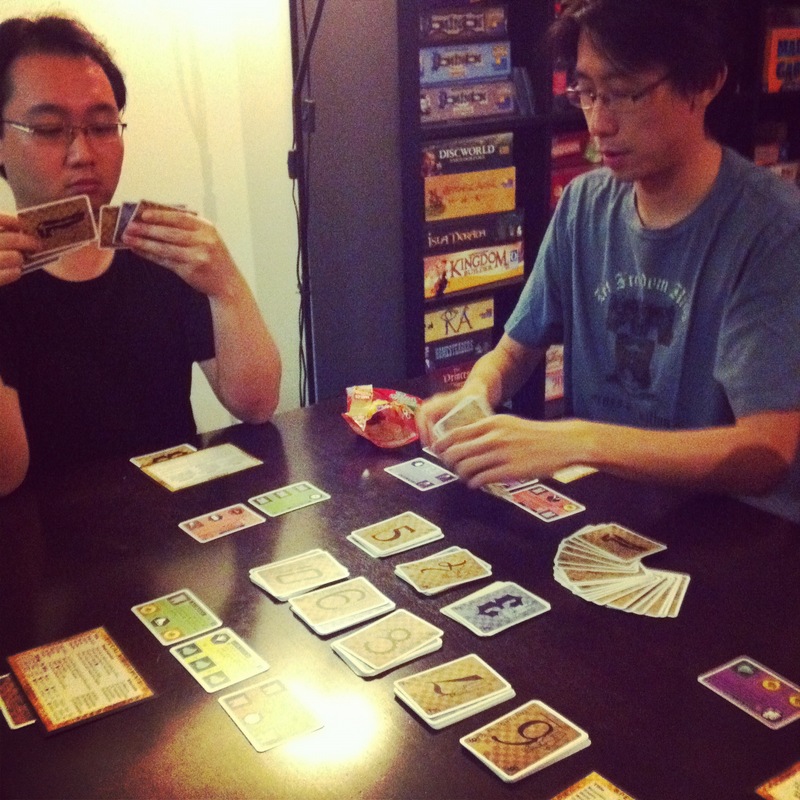 Numerous other effects can be played to help or hinder the process of digging/connecting the tunnel and the game goes on for three rounds, after which the player with the most gold wins. I did not play in this game and was not aware of how it played out, but here are some photos! 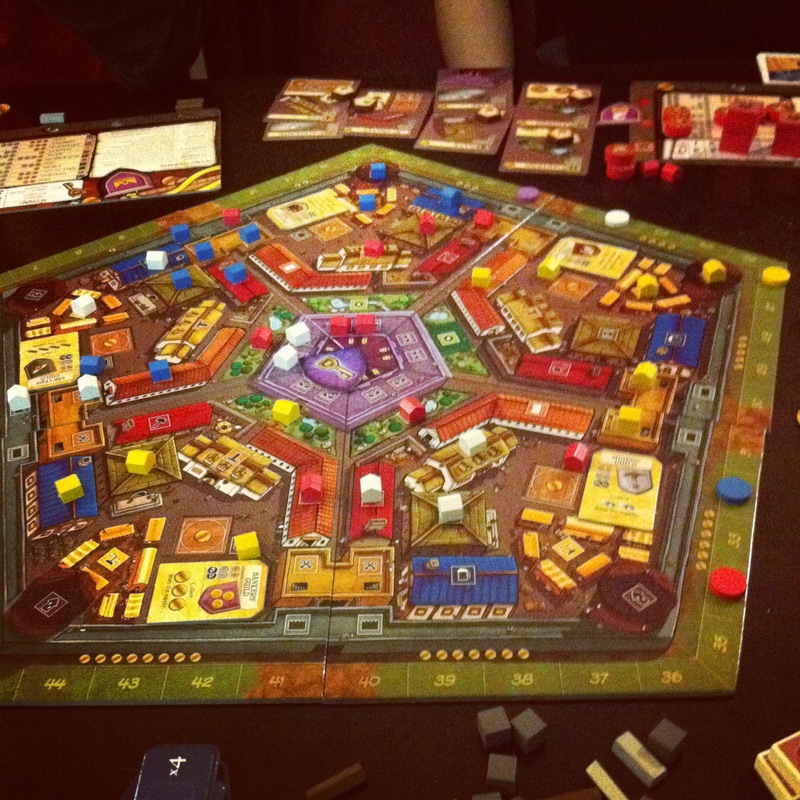 The final game of the night was Belfort, another offering from Tasty Minstrel Games. 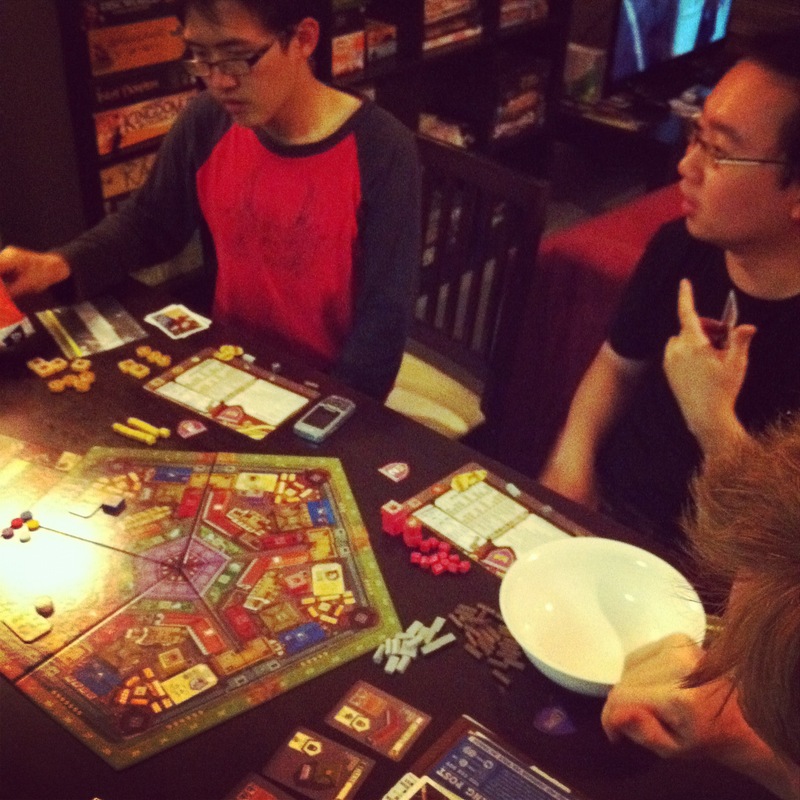 It is an area control game which also utilizes worker placement, resource collection, buildings and upgrade mechanics. Each player has two types of workers: Elves and Dwarves, which each collect different resources (Wood and Stone respectively). The workers are also used to take Guild actions and use Building special powers. 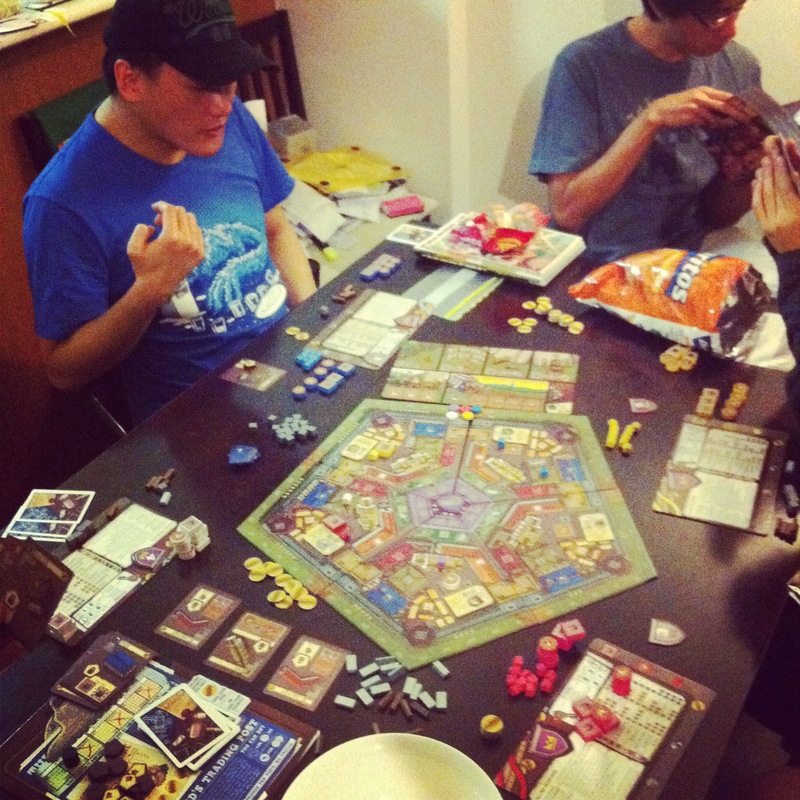 The resources are then used to build Buildings on the main board, which count towards area dominance in each of the five districts on the board. 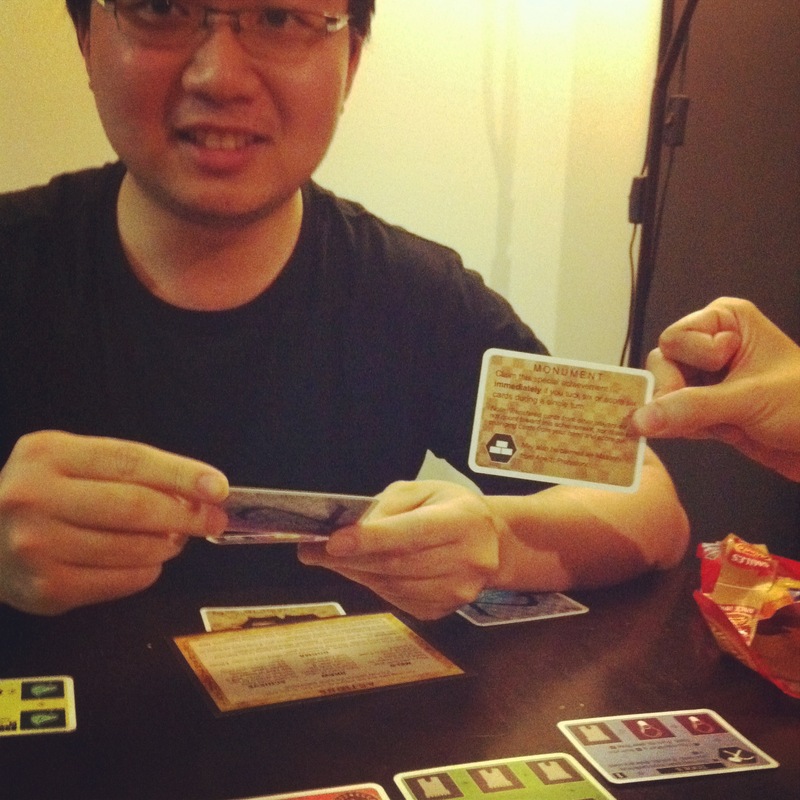 Cards representing the buildings also provide special abilities to their owner. 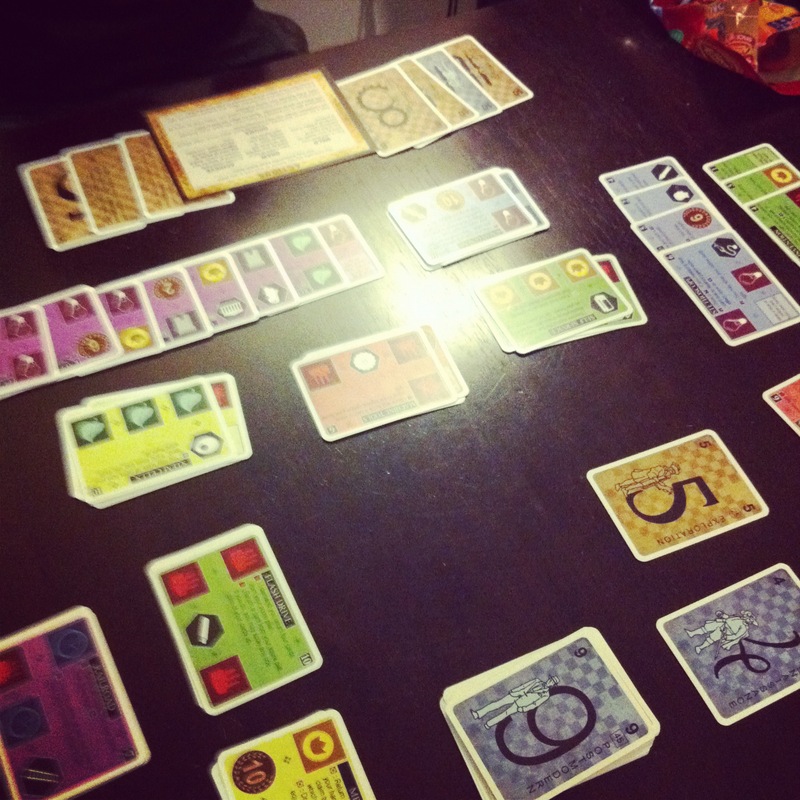 The game lasts 7 rounds, 3 of which are scoring rounds where area dominance and most number of worker types provide points. In this game, Daniel and myself started last in the first round and as we were all new to the game I think we made suboptimal plays in the first round, which lead to difficulties later. Steven had a good early start and had multiple districts to score, putting him in the lead early. 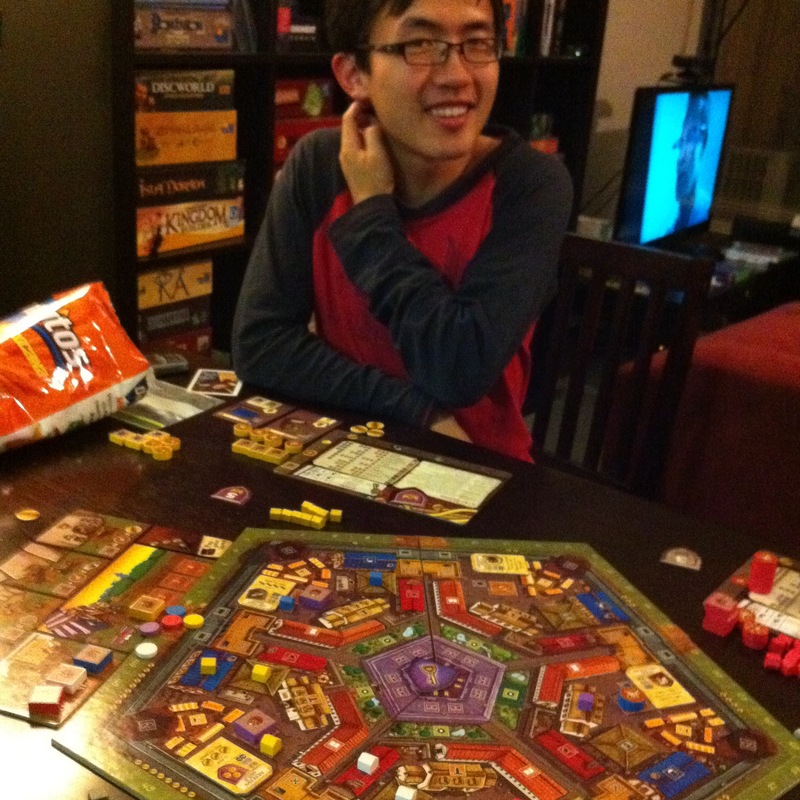 Heng Lin and Gerald had good workforces going, which gave them solid economies which let them catch up in the late game. In the final round, it was my decision on where to place my last building that greatly influenced the outcome of the game, tying with Steven for his district and allowing Gerald to overtake him in the final scoring and take victory! I will be doing a full description and review, but my initial impression was really good. The game doesn’t do anything particularly new or innovative, but incorporates existing mechanics very well to create a solid, fun game. 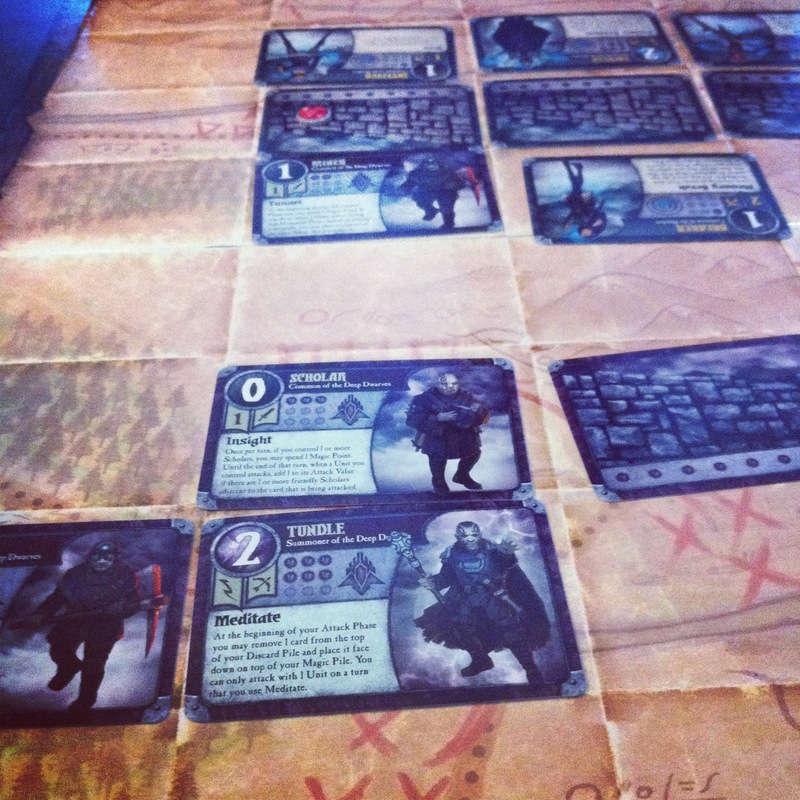 I also really appreciated the production design of the game, which I think is one of the most user-friendly implementations in a board game. 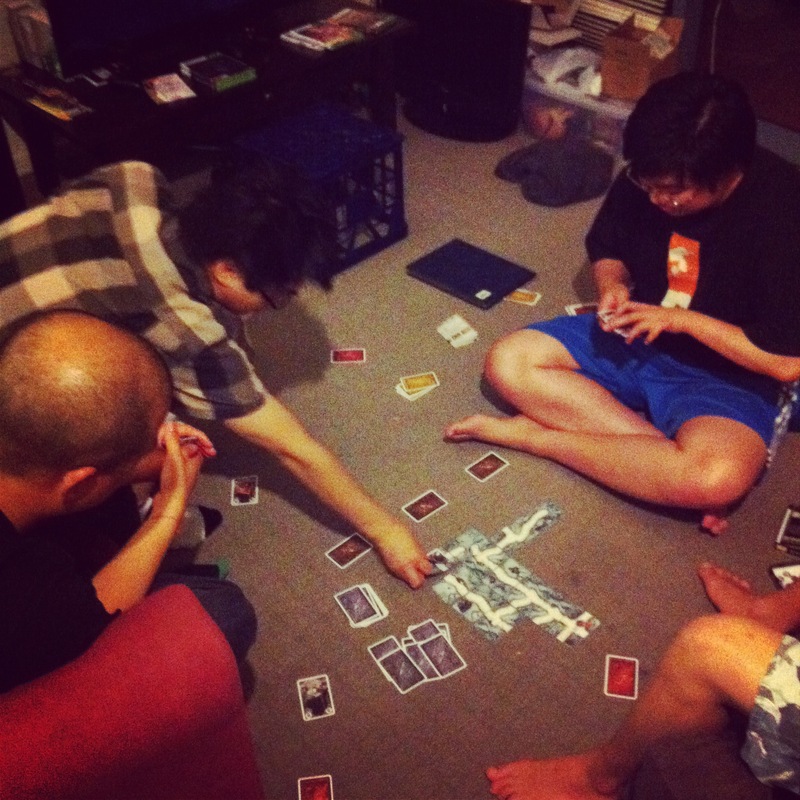 I had a really good time this last Saturday: Some great games played and another two games off my Achievements List. We’re having a pretty good streak of gaming on the weekends, and hopefully I will be done with all my unplayed games soon. Until next Saturday, happy gaming! Hey! 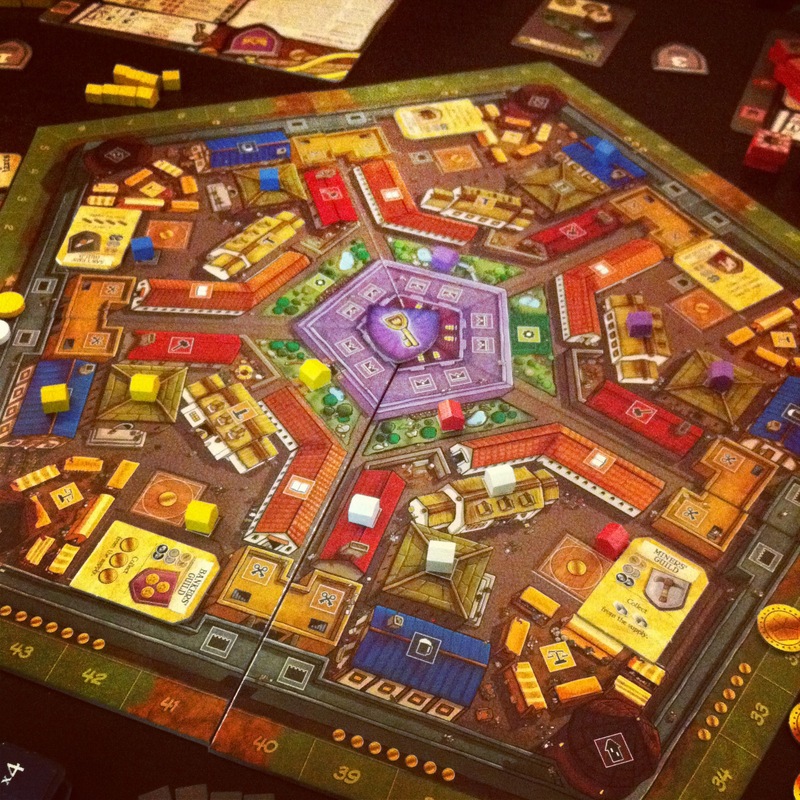 Thanks very much for playing Belfort! Enjoyed reading your session report and seeing your pics. Hope you continue to enjoy the game and I look forward to reading more of your blog. Hey! Thanks for enjoying the session report. 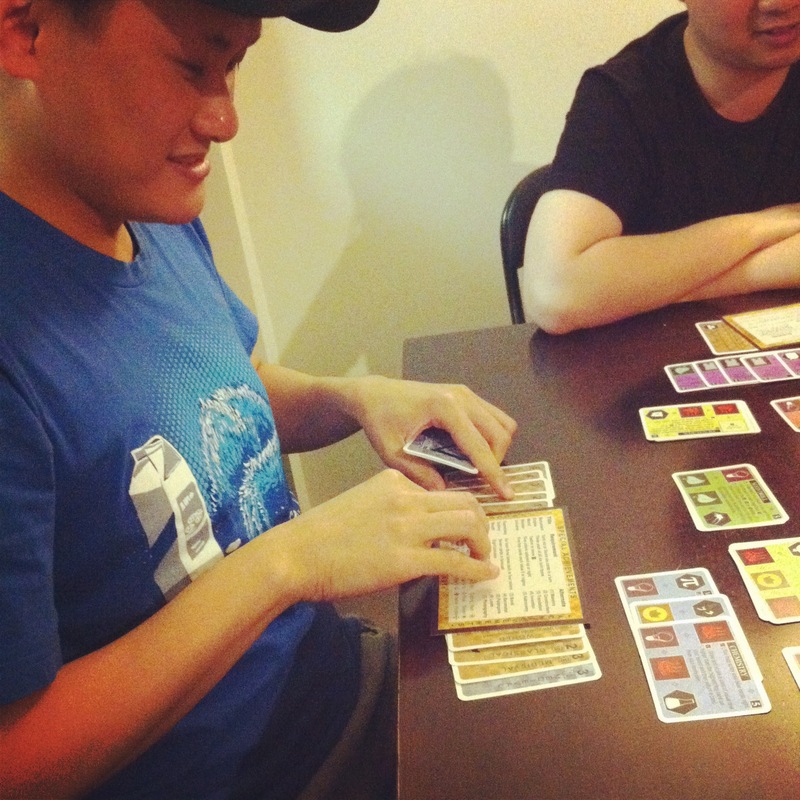 It is enjoyable because you made an enjoyable game :) Looking forward to trying your other designs too.